Place ingredients in order suggested by your manufacturer. It was very bland and didn't taste like anything. 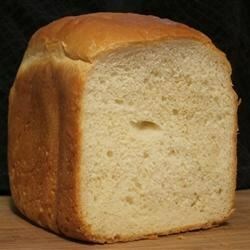 This is the best white bread recipe I have found so far. It is very easy to prepare and has a nice texture. Yum! I make this bread 2-3 times a week! The texture is great. I use the light crust setting. Great for sandwiches. Sent a copy of this recipe along with a bread machine to my dad for Father's Day!